Astro-Vision started its operations in Kochi, Kerala in 1984 and since then has been in the field of delivering the best Astrology Software. Astro-Vision's Malayalam astrology software is very popular and trusted by Astrologers around the world for over 25 years. Our Malayalam astrology software has found wide acceptance and a large client base both in India and abroad. Our Malayalam astrology software provides accurate, precise calculations and predictions. This time tested astrology software does the job of calculating the astrological values allowing you to focus on astrological analysis. Astro-Vision's Malayalam Astrology software comes with the complete set of calculations required for astrological analysis and astrology consultancy as per Vedic astrology. 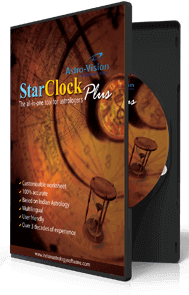 Your search for a Malayalam astrology software with calculations in Malayalam ends with Astro-Vision AstroPack Malayalam Astrology Software. 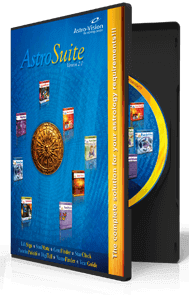 Just the right astrology software for you! In case you are looking for an astrology software which contains predictions, then check out Astro-Vision LifeSign Malayalam Astrology Software. Astro-Vision LifeSign Malayalam Astrology Software comes with various Ayanamsham settings, such as Chitrapaksha Ayanamsha or Lahiri Ayanamsha, Raman Ayanamsha, Krishnamurthy Ayanamsha, Thirukanitham Ayanamsha as well as a user defined Ayanamsha. These options are especially useful for astrologers and students of astrology interested in Indian astrology research. While selecting a custom ayanamsha, the method to be used for gulikadi group calculations can also be specified, i.e., whether the ascendant should be considered at period start or ascendant should be considered at period end. Astro-Vision LifeSign Malayalam Astrology Software includes a large database of cities from around the world. So you don’t have to spend time entering the latitude, longitude or time zones. An option to add more cities is also available, thus making it fully customisable. Choose from two options for dasa system, one consisting of 365.25 days while the other consisting of 360 days. A nazhika to hour convertor makes it easy for cross reference. Choose from two options available for selecting the method for bhava bala, one being the nature of mercury determined by association, the other being mercury as benefic, irrespective of association. The Malayalam Horoscope software is simple and easy to use. The menu options are easily accessible and the calculations reports are organised in an efficient manner. 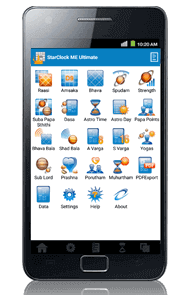 Now Malayalam Astrology Software comes with a special offer – FREE Malayalam Panchangam Software StarClock VX! The extremely popular Malayalam Panchangam Software has features like dual language mode i.e., reports can be made in English as well as Malayalam, representation of qualities of the planets, astrological qualities of the moment, exact rahu kala, gulika kala, transit times and transit positions and muhurtham software. 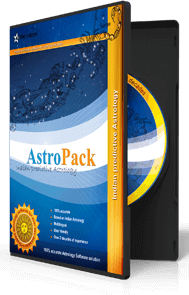 AstroPack Malayalam Astrology Software Calculates Birth Star (janma nakshatram ) as well as various astrological properties of the nakshatra and horoscope such as nakshatra padam, Birth rasi and the rasi adipati, Lagna Ascendant and the Lagnadhipati , Thidhi ( Lunar day ), Dinamana, Astrological Day of birth, Kalidina Sankhya, Nakshatra adhipati, Ganam, Yoni, Animal, Bird, Tree, Chandra Avastha, Chandra Vela, Chandra Kriya, Dagda Rasi, Karanam, Nithyayoga, Rasi of Sun - Star Position, Position of Angadityan, Yogi Point - Yogi Star, Yogi Planet, Duplicate Yogi, Avayogi Star – Planet, Atma Karaka (Soul) – Karakamsa, Amatya Karaka, Lagna Aruda (Pada) / Thanu and Dhana Aruda (Pada). Nirayana longitude of planets, which is the basis of calculations in the Indian system are derived from the Sayana values. All the charts, calculations and analysis provided in the Malayalam horoscope software are based on Vedic Astrology. The nirayana longitude of planets, the rasi, the longitude in the rasi, the nakshatra as well as nakshatra padam is calculated. The Nakshatra, nakshatra adhipati, sub lord as well as sub sub lord is calculated for each planet. A brief summary of the nirayana longitude of the planets is also provided along with the grahanila and amsakam in the Malayalam astrology software. The dasa as well as dasa balance at birth is also provided along with the grahanila and amsakam. A special rasi chakra chart is also provided in the Malayalam horoscope software, giving details of whether a navamsa or planet is in retrograde motion, or whether it is exalted, debilitated or combust. AstroPack Malayalam Jathakam software also provides the bhava chart and the bhava pattika giving details of the arambham, madhyam, anthyam and the list of planets located in bhava. Corresponding to each planet, a sub-planet (Upagraha) is calculated in the Malayalam horoscope software. The sub planets of Moon, Venus, Mars, Rahu and Ketu or sarapam shihi are based on the longitude of the Sun and these values are calculated. The dhumadi group of Sub Planets is provided in a table with details of the method of calculation for each of these sub planets. The Upagraha longitudes are also calculated and presented in table format for easy reference. The Nakshatra adhipati / Sub-Lord / Sub-Sub-Lord Charts of Upagrahas are also available. The Upagraha rasi chakra is calculated and the Upagaraha rasi chakra is provided. AstroPack Malayalam Horoscope software calculates the values corresponding to the aruda chakra chart and prepares the aruda chakra. AstroPack Malayalam Jathakam software calculates the values present in the shodasavargha table and prepares the corresponding table. AstroPack Horoscope software in Malayalam calculates the Lords of the shodasavarga and presents it in chart format for easy reference. AstroPack Malayalam Horoscope software calculates the vargottama. AstroPack Malayalam Jathagam software calculates the varga bheda values wherein points are allocated for Swavarga (own house) and Uchavarga (exaltation). The varga bheda table is also prepared. AstroPack Malayalam Astrology Software prepares various charts after making the necessary calculations such as the rasi chakram, Hora chart, Drekkanam chart, Chathurthamsa chart, Saptamsa chart, Amsakam, Dasamsa chart, Dwadasamsa chart, Shodasamsa chart, Vimsamsa chart, Chathurvimsamsa chart, Bhamsa chart, Trimsamsa chart, Khavedamsa chart, Akshavedamsa chart and Shashtiamsa chart. Details of the Dasa and Bhukti (Apahara) periods are given with details of the arambham and anthyam for each Bhukti (Apahara) within each Dasa period. AstroPack Malayalam Astrology Software presents the details of the Paryanthardasa within each Bhukti (Apahara) including the arambham and Anthyam for each Paryanthardasa. AstroPack Malayalam Astrology Software calculates the values pertaining to various Ashtakavarga Charts and prepares all the different Ashtakavarga Charts such as the Chandra Ashtakavarga chart, Surya Ashtakavarga chart, Budha Ashtakavarga chart, Shukra Ashtakavarga chart, Kuja Ashtakavarga chart, Guru Ashtakavarga chart, Sani Ashtakavarga chart and the Sarva Ashtakavarga chart. Various Ashtakavarga charts after reductions are also prepared and presented in the Malayalam Jathagam software. An analysis of the planetary disposition including Lords of Houses, the Bhava lord of each house, Planetary conjunction (yogam), Planet to planet aspects, Planet to house aspects, Benefic Planets and Malefic planets and their effects, Friendship Chart , Aspect Strength Chart (Drikbala) in Shashtiamsas, Shadbala Table, Bhava Aspect Strength Chart (Bhava Drikbala) in Shashtiamsas, Bhava Bala Table, Kuja Dosha Check or chovva dosham check, Moudhyam (combustion), Graha Yuddha (Planetary war) and Grahavastha is presented in AstroPack Malayalam Astrology Software. A brief summary of Vimshottari Dasa periods is given in the Malayalam astrology software. The important combinations which result in a yogam are identified in the horoscope and are listed with a brief mention of the effect it can have. While listing the Yogams, the combinations which resulted in the yogam are also given for easy reference in AstroPack Malayalam Astrology Software. ആസ്ട്രോ-വിഷന് 1984 ല് കേരളത്തിലെ കൊച്ചിയില് പ്രവര്ത്തനം ആരംഭിച്ചു, അന്നു മുതല് മികച്ച ജ്യോതിഷ സോഫ്ട് വെയര് പ്രദാനം ചെയ്യുന്ന രംഗത്ത് പ്രവര്ത്തിച്ചു വരുന്നു 25 വര്ഷങ്ങളായി ആസ്ട്രോ-വിഷന്റെ മലയാളം ജ്യോതിഷ സോഫ്ട് വെയര് പ്രചുര പ്രചാരമുള്ളതും ലോകമെമ്പാടുമുള്ള ജ്യോല്സ്യരുടെ വിശ്വസ്തത നേടിയതുമാണ്. ഞങ്ങളുടെ മലയാളം ജ്യോതിഷ സോഫ്ട് വെയറിന് വ്യാപകമായ സ്വീകാര്യതയുള്ളതും ഇന്ത്യയിലും വിദേശത്തുമായി ധാരാളം കക്ഷികള് ഉള്ളതുമാണ്. ഞങ്ങളുടെ മലയാളം ജ്യോതിഷ സോഫ്ട് വെയര് കൃത്യതയാര്ന്നതും സൂക്ഷ്മവുമായ ഗണനനങ്ങളും പ്രവചനങ്ങളും നല്കുന്നു. പരിശോധിക്കപ്പെട്ട ജ്യോതിഷ സോഫ്ട് വെയര് ജ്യോതിഷ മൂല്യങ്ങള് ഗണിക്കുന്ന ജോലി ഏറ്റെടുക്കുന്നതിനാല് ഇപ്പോള് നിങ്ങള്ക്ക് അപഗ്രഥനത്തില് കൂടുതല് ശ്രദ്ധ കേന്ദ്രീകരിക്കുവാന് കഴിയുന്നു. വേദ ജ്യോതിഷ പ്രകാരം ജ്യോതിഷ അപഗ്രഥനത്തിനും ജ്യോതിഷ പ്രവചനത്തിനും ആവശ്യമായിട്ടുള്ള മുഴുവന് ഗണനങ്ങളോടും കൂടിയാണ് ആസ്ട്രോ-വിഷന്റെ മലയാളം ജ്യോതിഷ സോഫ്ട് വെയര് അവതരിപ്പിച്ചിട്ടുള്ളത്. മലയാളത്തിലുള്ള ഗണനത്തോട് കൂടിയ ഒരു മലയാളം ജ്യോതിഷ സോഫ്ട് വെയറിനായുള്ള നിങ്ങളുടെ അന്വേഷണം ആസ്ട്രോ-വിഷന് ആസ്ട്രോ പാക് മലയാളം ജ്യോതിഷ സോഫ്ട് വെയറില് അവസാനിക്കുന്നു. നിങ്ങള്ക്ക് വേണ്ട ശരിയായ ജ്യോതിഷ സോഫ്റ്റ് വെയര്! നിങ്ങള് നോക്കുന്നത് പ്രവചനങ്ങള് ഉള്പ്പെടുന്ന ഒരു ജ്യോതിഷ സോഫ്റ്റ് വെയര് ആണങ്കില്, ആസ്ട്രോ-വിഷന് ലൈഫ്സൈന് മലയാളം ജ്യോതിഷ സോഫ്ട് വെയര് പരീക്ഷിച്ച് നോക്കുക. ചിത്രപക്ഷ അയനാംശം അല്ലങ്കില് ലാഹിരി അയനാംശം, രാമന് അയനാംശം, കൃഷ്ണമൂര്ത്തി അയനാംശം, തിരുകണിതം അയനാംശം എന്നിവ പോലുള്ളത് കൂടാതെ ഉപയോഗിയ്ക്കുന്ന ആള്ക്ക് തന്നെ നിര്വചിക്കാവുന്ന അയനാംശം അടക്കം വിവിധ അയനാംശങ്ങള് ചിട്ടപ്പെടുത്തുവാനാകും വിധമാണ് ആസ്ട്രോ-വിഷന് ലൈഫ്സൈന് മലയാളം ജ്യോതിഷ സോഫ്ട് വെയര് എത്തുന്നത്. ജ്യോല്സ്യര്ക്കും ഭാരതീയ ജ്യോതിഷത്തില് ഗവേഷണം നടത്തുവാന് താത്പര്യമുള്ള വിദ്യാര്ഥികള്ക്കും ഈ ഓപ്ഷനുകള് വിശേഷിച്ചും പ്രയോജനപ്രദമാണ്. ക്രമപ്രകാരമുള്ള അയനാംശം തിരഞ്ഞെടുക്കുമ്പോള്, ഗുളികാദി വിഭാഗങ്ങളുടെ ഗണനത്തിനായി ഉപയോഗിയ്ക്കുന്ന രീതി കൂടി പരാമര്ശിക്കേണ്ടതുണ്ട്, അതായത്, ഉച്ചരാശി ആരംഭ കാലത്ത് ആണോ അല്ലങ്കില് ഉച്ചരാശി അന്ത്യ കാലത്ത് ആണോ പരിഗണിക്കേണ്ടത്. ആസ്ട്രോ-വിഷന് ലൈഫ്സൈന് മലയാളം ജ്യോതിഷ സോഫ്ട് വെയര് ലോകമെമ്പാടുമുള്ള നഗരങ്ങളുടെ ഒരു വലിയ ഡേറ്റാബേസ് ഉള്ക്കൊള്ളുന്നു. അതിനാല് അക്ഷാംശവും രേഖാംശവും അല്ലങ്കില് ടൈം സോണുകള് എന്റര് ചെയ്യുവാന് നിങ്ങള് സമയം ചിലവഴിക്കേണ്ടി വരുന്നില്ല. കൂടുതല് നഗരങ്ങള് കൂട്ടിച്ചേര്ക്കുന്നതിനുള്ള സൌകര്യവും ലഭ്യമാണ്, അങ്ങനെ അത് പൂര്ണ്ണമായും ഉപഭോക്താവിന്റെ ആവശ്യങ്ങള്ക്ക് അനുസരിച്ച് ഉപയോഗിക്കാവുന്നതാകുന്നു. ദശാ രൂപങ്ങള് രണ്ട് ഓപ്ഷനുകളില് നിന്നും തിരഞ്ഞെടുക്കുക, ഒന്നില് 362.25 ദിവങ്ങള് ഉള്ളപ്പോള് മറ്റേതില് 365 ദിവസങ്ങളാണുള്ളത്. നാഴികയില് നിന്നും മണിക്കൂറിലേക്കുള്ള കണ്വേര്ട്ടര് പരസ്പരം മാറി ഉപയോഗിക്കുന്നത് എളുപ്പമാക്കുന്നു. ഭാവ ബലത്തിന്റെ രീതി തിരഞ്ഞെടുക്കുന്നതിനായി ലഭ്യമായിട്ടുള്ള രണ്ട് ഓപ്ഷനുകളില് നിന്നും തിരഞ്ഞെടുക്കുക, ഒന്നില് ബുധന് നിശ്ചയിക്കപ്പെടുന്നത് സംയോഗത്താലാണ്, മറ്റേതില് ബുധന് സംയോഗം പരിഗണിക്കാതെ ബുധനെ ശുഭകാരിയായി എടുക്കുന്നു. മലയാളം ജാതകം സോഫ്റ്റ് വെയര് ലളിതവും ഉപയോഗിക്കുവാന് എളുപ്പമുള്ളതുമാണ്. മെനു ഓപ്ഷനുകള് എളുപ്പത്തില് പ്രാപ്യമായവയും ഗണിതങ്ങളും റിപ്പോര്ട്ടുകളും കാര്യക്ഷമമായ രീതിയില് ചിട്ടപ്പെടുത്തിയിട്ടുള്ളവയുമാണ്. ഇപ്പോള് മലയാളം ജ്യോതിഷ സോഫ്ട് വെയര് ഒരു പ്രത്യേക വാഗ്ദാനത്തോടെയാണ് എത്തുന്നത് - സൌജന്യ മലയാളം പഞ്ചാംഗം സോഫ്റ്റ് വെയര് സ്റ്റാര്ക്ലോക്ക്VX! ദ്വിഭാഷാ മോഡ്, അതായത് ഇംഗ്ലീഷിലും മലയാളത്തിലും റിപ്പോര്ട്ടുകള് എടുക്കുവാനുള്ള സൌകര്യം, ഗ്രഹങ്ങളുടെ വിശേഷണങ്ങള്, ആ സമയത്തിന്റെ ജ്യോതിഷ പ്രാധാന്യം, കൃത്യമായ രാഹു കാലം, ഗുളിക കാലം, ദശാകാലം മാറുന്ന സമയങ്ങളും സ്ഥാനങ്ങളും, കൂടാതെ മുഹൂര്ത്തം സോഫ്റ്റ് വെയര് തുടങ്ങി പലവിധ സവിശേഷതലുള്ള മലയാളം പഞ്ചാംഗം സോഫ്റ്റ് വെയര് വളരെ ജനപ്രിയമായതാണ്. ആസ്ട്രോ പാക് മലയാളം ജ്യോതിഷ സോഫ്ട് വെയര് ജന്മ നക്ഷത്രം ഗണിക്കുന്നതിനോടൊപ്പം നക്ഷത്ര പാദം, ജന്മ രാശിയും രാശി അധിപതിയും, ലഗ്ന ഉച്ചാരാശിയും ലഗ്നാധിപതിയും, തിഥി (ചാന്ദ്ര ദിവസം), ദിനമാനം, ജ്യോതിഷ ജന്മ ദിവസം, കലിദിന സംഖ്യ, നക്ഷത്ര അധിപതി, ഗണം, യോനി, മൃഗം, പക്ഷി, വൃക്ഷം, ചന്ദ്ര അവസ്ഥ, ചന്ദ്ര വേല, ചന്ദ്ര ക്രിയ, ദഗ്ദ രാശി, കരണം, നിത്യയോഗം, സൂര്യ- ഗ്രഹ സ്ഥാനത്തിന്റെ രാശി, ആദിത്യന്റെ സ്ഥാനം, യോഗി ബിന്ദു – യോഗി നക്ഷത്രം, യോഗി ഗ്രഹം, പകര്പ്പ് യോഗി, അവയോഗി നക്ഷത്രം – ഗ്രഹം, ആത്മ കാരകം (ആത്മാവ്) – കാരകാംശം, അമാത്യ കാരകം, ലഗ്ന ആരൂഢം (പദം) / തനു ആരൂഡവും ധന അരൂഡവും (പദം) എന്നിവപോലോലുള്ള നക്ഷത്രത്തിന്റേയും ജാതകത്തിന്റേയും വിവിധ ജ്യോതിഷ ഘടകങ്ങളും കൂടി ഗണിച്ചെടുക്കുന്നു. ഗ്രഹങ്ങളുടെ നിരായന അക്ഷാംശം, ഭാരതീയ സമ്പ്രദായത്തില് ഗണനത്തിന്റെ അടിസ്ഥാനമായ ഇത് ശയന മൂല്യങ്ങളില് നിന്നാണ് ഉത്ഭവിച്ചിട്ടുള്ളത്. മലയാളം ജാതകം സോഫ്റ്റ് വെയറില് ലഭ്യമാക്കിയിട്ടുള്ള മുഴുവന് ചാര്ട്ടുകളും, ഗണനങ്ങളും വിശകലനങ്ങളും വേദ ജ്യോതിഷം ആധാരമാക്കിയുള്ളതാണ്. ഗ്രഹങ്ങളുടെ നിരായന അക്ഷാംശം, രാശി, രാശിയിലെ അക്ഷാംശം, നക്ഷത്രം, നക്ഷത്ര പാദം എന്നിവ ഗണിച്ചിരിക്കുന്നു. ഓരോ ഗ്രഹത്തിനും നക്ഷത്രം, നക്ഷത്ര അധിപതി, ഉപ ദേവത അതോടൊപ്പം ഉപ ഉപ ദേവത എന്നിവയും ഗണിച്ചിട്ടുണ്ട്. മലയാളം ജ്യോതിഷ സോഫ്ട് വെയറില് ഗ്രഹനിലയോടും അംശകത്തോടും ഒപ്പം ഗ്രഹങ്ങളുടെ നിരായന അക്ഷാംശത്തിന്റെ ഒരു ലഘു സംഗ്രഹം കൂടി ലഭ്യമാക്കിയിട്ടുണ്ട്. ഗ്രഹനിലയോടും അംശകത്തോടും ഒപ്പം ജനന സമയത്തെ ദശയും ദശാശിഷ്ടവും കൂടി നല്കുന്നു. ഒരു നവാംശം അല്ലങ്കില് ഗ്രഹം പ്രലോമ ഗതിയിലാണോ അല്ലങ്കില് ഉന്നമിപ്പിക്കുന്നതാണോ അല്ലങ്കില് ക്ഷയിപ്പിക്കുന്നതാണോ അല്ലങ്കില് ദഹിപ്പിക്കുന്നതാണോ എന്നുള്ള വിവരങള് നല്കുന്ന പ്രത്യേകമായ ഒരു രാശി ചക്ര ചാര്ട്ട് കൂടി മലയാളം ജാതകം സോഫ്റ്റ് വെയര് നല്കുന്നു. ഭാവത്തില് സ്ഥിതിചെയ്യുന്ന ഗ്രഹങ്ങളുടെ ആരംഭം, മധ്യം, അന്ത്യം എന്നിവയുടെ വിശദാംശങ്ങള് നല്കുന്ന ഭാവ ചാര്ട്ടും ഭാവ പട്ടികയും കൂടി ആസ്ട്രോ പാക് മലയാളം ജാതകം സോഫ്റ്റ് വെയര് നല്കുന്നു. മലയാളം ജാതകം സോഫ്റ്റ് വെയറില് ഓരോ ഗ്രഹത്തോടും ബന്ധപ്പെട്ട ഒരു ഉപ-ഗ്രഹം (ഉപഗ്രഹം) ഗണിച്ചിട്ടുണ്ട്. ഉപ ഗ്രഹങ്ങളായ ചന്ദ്രന്, ശുക്രന്, ചൊവ്വ, രാഹുവും കേതുവും അല്ലങ്കില് സര്പ്പം എന്നിവ സൂര്യന്റെ അക്ഷാംശം അടിസ്ഥാനമാക്കി അവയുടെ മൂല്യങ്ങളും ഗണിച്ചിട്ടുണ്ട്. ധൂമാദി ഗണത്തില് പെട്ട ഉപ ഗ്രഹങ്ങള് ഒരു പട്ടികയായി ഈ ഓരോ ഉപഗ്രഹവും ഗണിക്കുവാന് ഉപയോഗിച്ച രീതികളുടെ വിശദാംശങ്ങള് സഹിതം നല്കിയിരിക്കുന്നു. എളുപ്പത്തിലുള്ള റഫറന്സിനായി ഉപഗ്രഹ അക്ഷാംശങ്ങള് ഗണിച്ച് ഒരു പട്ടിക രൂപത്തില് അവതരിപ്പിച്ചിരിക്കുന്നു. ഉപഗ്രഹങ്ങളുടെ നക്ഷത്ര അധിപതി / ഉപ-ദേവത / ഉപ-ഉപ-ദേവത ചാര്ട്ടുകള് എന്നിവയും ലഭ്യമാണ്. ഉപഗ്രഹ രാശി ചക്രം ഗണിച്ച് ഉപഗ്രഹ രാശി ചക്രവും നല്കിയിട്ടുണ്ട്. ആസ്ട്രോ പാക് മലയാളം ജാതകം സോഫ്റ്റ് വെയര് ആരൂഡ ചക്രം ചാര്ട്ട് സംബന്ധമായ മൂല്യങ്ങള് ഗണിക്കുകയും ആരൂഡ ചക്രം തയ്യാറാക്കുകയും ചെയ്യുന്നു. ആസ്ട്രോ പാക് മലയാളം ജാതക സോഫ്റ്റ് വെയര് ഷോഡശവര്ഗ പട്ടികയിലുള്ള മൂല്യങ്ങള് ഗണിക്കുകയും തല് സംബന്ധിയായ പട്ടിക തയ്യാറാക്കുകയും ചെയ്യുന്നു. മലയാളത്തിലുള്ള ആസ്ട്രോ പാക് ജാതകം സോഫ്റ്റ് വെയര് ഷോഡശവര്ഗത്തിന്റെ ദേവതകള് ഗണിച്ചെടുക്കുകയും അവ എളുപ്പത്തിലുള്ള റഫറന്സിനായി ചാര്ട്ട് രൂപത്തില് അവതരിപ്പിക്കുകയും ചെയ്യുന്നു. ആസ്ട്രോ പാക് മലയാളം ജാതകം സോഫ്റ്റ് വെയര് വര്ഗോത്തമം ഗണിക്കുന്നു. ആസ്ട്രോ പാക് മലയാളം ജാതകം സോഫ്റ്റ് വെയര് വര്ഗഭേദം ഗണിക്കുകയും അവിടെ സ്വവര്ഗ (സ്വക്ഷേത്രം) ത്തിനും ഉച്ചവര്ഗത്തിനും പോയിന്റുകള് നല്കുകയും ചെയ്യുന്നു. വര്ഗഭേദ പട്ടിക കൂടി തയ്യാറാക്കുന്നു. രാശി ചക്രം, ഹോര ചാര്ട്ട്, ദ്രക്കോണം ചാര്ട്ട്, ചതുര്ധാംശ ചാര്ട്ട്, സപ്താംശ ചാര്ട്ട്, അംശകം, ദാസമാംശ ചാര്ട്ട്, ദ്വാദശാംശ ചാര്ട്ട്, ഷോഡശാംശ ചാര്ട്ട്, വിംശാംശ ചാര്ട്ട്, ചതുര്വിംശാംശ ചാര്ട്ട്, ഭാംശ ചാര്ട്ട്, തൃംശാംശ ചാര്ട്ട്, ഖാവേദാംശ ചാര്ട്ട്, അക്ഷവേദാംശ ചാര്ട്ട്, ഷഷ്ട്യാംശ ചാര്ട്ട് തുടങ്ങി ആവശ്യമായ ഗണനങ്ങള് നടത്തിയ ശേഷം ആസ്ട്രോ പാക് മലയാളം ജ്യോതിഷ സോഫ്ട് വെയര് വിവിധ ചാര്ട്ടുകള് തയ്യാറാക്കുന്നു. ഓരോ ദശാ കാലത്തിലും ഉള്ള ഓരോ ഭുക്തി(അപഹാരം) കാലത്തിന്റേയും ആരംഭവും അന്ത്യവും അടക്കം ദശാ കാലത്തിന്റേയും ഭുക്തി (അപഹാര) കാലത്തിന്റേയും വിശദാംശങ്ങളും നല്കിയിട്ടുണ്ട്. ഓരോ പര്യാന്തരദശയുടേയും ആരംഭവും അന്ത്യവും അടക്കം ഓരോ ഭുക്തി(അപഹാരം) ത്തിലുമുള്ള പര്യാന്തരദശയുടെ വിശദാംശങ്ങളും ആസ്ട്രോ പാക് മലയാളം ജ്യോതിഷ സോഫ്ട് വെയര് അവതരിപ്പിക്കുന്നു. വിവിധ അഷ്ടകവര്ഗ ചാര്ട്ടുകളുമായി ബന്ധപ്പെട്ട മൂല്യങ്ങള് ആസ്ട്രോ പാക് മലയാളം ജ്യോതിഷ സോഫ്ട് വെയര് ഗണിക്കുന്നു, കൂടാതെ ചന്ദ്ര അഷ്ടകവര്ഗ ചാര്ട്ട്, സൂര്യ അഷ്ടകവര്ഗ ചാര്ട്ട്, ബുധ അഷ്ടകവര്ഗ ചാര്ട്ട്, ശുക്ര അഷ്ടകവര്ഗ ചാര്ട്ട്, കുജ അഷ്ടകവര്ഗ ചാര്ട്ട്, ഗുരു അഷ്ടകവര്ഗ ചാര്ട്ട്, ശനി അഷ്ടകവര്ഗ ചാര്ട്ട്, സര്വ അഷ്ടകവര്ഗ ചാര്ട്ട് മുതലായ വിവിധങ്ങളായ എല്ലാ അഷ്ടവര്ഗ ചാര്ട്ടുകളും ഗണിക്കുന്നു. ന്യൂനികരണത്തിന് ശേഷമുള്ള വിവിധ അഷ്ടകവര്ഗ ചാര്ട്ടുകളും കൂടി മലയാളം ജാതകം സോഫ്റ്റ് വെയറില് തയ്യാറാക്കി അവതരിപ്പിക്കുന്നുണ്ട്. ദേവതാ ക്ഷേത്രങ്ങള്, ഓരോ ക്ഷേത്രത്തിന്റേയും ഭാവ ദേവത, ഗ്രഹങ്ങളുടെ സംയോജനം (യോഗം), ഗ്രഹവും ഗ്രഹവുമായുള്ള നില, ഗ്രഹവും ക്ഷേത്രവുമായുള്ള നില, ശുഭ ഗ്രഹങ്ങളും അശുഭ ഗ്രഹങ്ങളും അവയുടെ സ്വാധീനവും എന്നിവ അടക്കം ഗ്രഹനിലയുടെ ഒരു വിശകലനം, സൌഹൃദ ചാര്ട്ട്, ഷഷ്ട്യാംശങ്ങളില് ഗ്രഹനിലയുടെ ബല ചാര്ട്ട് (ദ്രിക്ബലം), ഷഡ്ബല പട്ടിക, ഷഷ്ട്യാംശങ്ങളിലുള്ള ഭാവ ബല ചാര്ട്ട് (ഭാവ ദ്രിക്ബലം), ഭാവ ബല പട്ടിക, കൂജ ദോഷ പരിശോധന അല്ലങ്കില് ചൊവ്വാ ദോഷ പരിശോധന, മൌഡ്യം (ദഹനം), ഗ്രഹായുദ്ധം (ഗ്രഹങ്ങളുടെ യുദ്ധം), ഗ്രഹാവസ്ഥ എന്നിവയും ആസ്ട്രോ പാക് മലയാളം ജ്യോതിഷ സോഫ്ട് വെയറില് അവതരിപ്പിച്ചിട്ടുണ്ട്. വിംശോത്തരി ദശാ കാലങ്ങളുടെ ഒരു ലഘു സംഗ്രഹവും മലയാളം ജ്യോതിഷ സോഫ്ട് വെയര് നല്കുന്നുണ്ട്. ഒരു യോഗത്തിന് കാരണമാകുന്ന പ്രധാന കൂട്ടുകെട്ടുകള് ജാതകത്തില് കണ്ടെത്തുകയും ഒരു ചെറു സൂചനയോടെ അവയുണ്ടാക്കുന്ന സ്വാധീനം പട്ടികപ്പെടുത്തുകയും ചെയ്തിട്ടുണ്ട്. യോഗങ്ങള് പട്ടികപ്പെടുത്തുമ്പോള്, എളുപ്പത്തിലുള്ള റഫറന്സിനായി യോഗത്തിന് കാരണമാകുന്ന പ്രധാന കൂട്ടുകെട്ടുകള് കൂടി ആസ്ട്രോ പാക് മലയാളം ജ്യോതിഷ സോഫ്ട് വെയര് നല്കുന്നു. 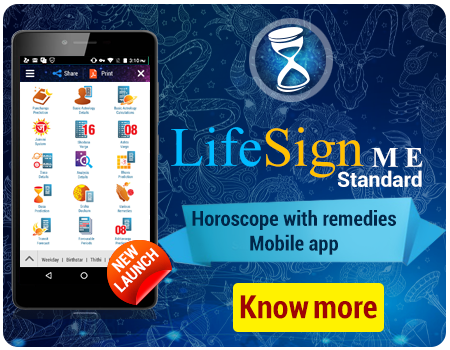 Get a splendid combination of Astrology Softwares including usefull Horoscope calculations, Panchanga, Muhurtha, Horoscope Matching & lots more. Available in English, Telugu, Tamil, Kannada, Malayalam languages.